Time to make your life a little easier. 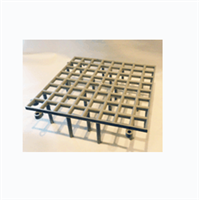 These heavy duty floor grates reduce the need to clean every day. Very strong durable plastic construction. Strong enough for anyone to walk on. Each grate locks into each other using a system of pegs and openings built into each grate. Size of each opening in the grate is approximately 1 inch – easy for the birds to walk on. They can be cut to fit any floor layout. Easy to clean, brush or hose off. Each grate measures 10"W x 10"L x 3"H and costs $4.20 each. See 2nd picture - a section of 4 floor grates attached to each other - would cover a 20" x 20" area. Cost would be $16.80.